This volume presents a synthesis of the information available concerning the prehistory of Oregon. The Bureau of Land Management publishes this study as a part of its "Adventures in the Past" public outreach effort and in recognition of its responsibility to make information gained through its Cultural Resources Management Program available to scholars and to the general public. 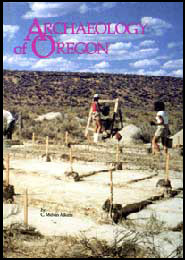 The chapters of Archaeology of Oregon are Adobe Acrobat PDF files and range in size from 1.2 MB to 16.6 MB. Allow some extra time, they may open slowly. Hard copies of this publication can be obtained by calling or visiting BLM's Public Information Center.